If you are new to my blog then here is a little explanation as to what my kitchen of the month posts are all about. Each month I feature a photo of a kitchen that I have found around the web as my "kitchen of the month". (mostly on pinterest- is there a better place for inspiration?) As someone who really enjoys cooking and sometimes baking I spend plenty of time in that specific room. In fact my kitchen is at the center of my very small apartment which means loads of stuff gets done in there from makeup work, to blog photography and even some of my youtube videos. 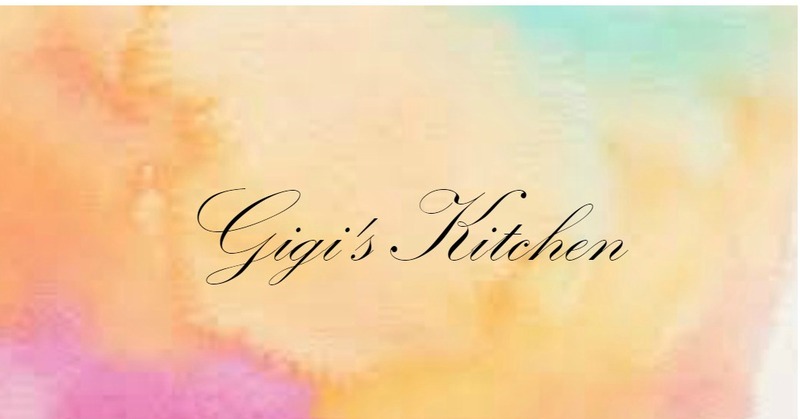 Hence the origin of my blog name- Gigi's Kitchen in the first place. Luckily we are currently on the search for a new home of our own and as I've mentioned here previously I really look forward to having more room to work in as well as my very own kitchen to decorate to my hearts desire (when my budget allows for it). So lets talk about this months kitchen! It's from pinterest of course, care of Better Homes & Gardens which is quickly becoming one of my favorite websites. Their magazine was on this months wish list post too because I don't think I could ever get enough of pretty home design photos and inspiration. I think this kitchen easily proves that with very little space you can do so much. The lighter yellow color used in all of the cabinetry does aid in opening the room up making it appear larger and downright cheerful! 1) Those stools- The carvings on the sides are very intricate and so classy looking. The white and brown colors certainly compliment that yellow background too. 2) The lighting- This bronze piece is so interesting, different and visually appealing as well. It hangs in the perfect spot and adds a really pretty touch to this kitchen. 3) That large side cabinet for dishes and vases etc. is a great space saver and it stands out for all the right reasons. 4) The plants- Something I often admire in other peoples homes are their indoor potted plants. I will definitely have some of my own some day including herbs to cook with. These ones were placed wonderfully next to a big window where they can thrive. There is just one thing I'm not crazy about in this one and it is the back splash behind the oven. Although it suits an overall kitchen look I don't think it meshes well in this specific room. If it were my own I would go with something quite plain and solid as I just feel it would be far more suitable. The color yellow makes me think of all things happy and my kitchen is a place I go to relax and wind down at times and at others to get things done so a positive aura is of great importance to me. This light yellow color is so appealing. In fact I can see myself cooking in a kitchen like this one easily. What do you think of this kitchen? Let me know in the comments form below- I absolutely love to hear from my readers! Do you have a kitchen to share? Please send it to me by email or by any of my forms of social media and it could just be featured here in the months ahead!